After about a year of taking the same journey every morning, and afternoon, I have come to a rather unsettling realisation: I spend roughly two and a half hours a day on a bus. That's seventeen and a half hours a week. Seventy hours a month, and nine hundred and thirteen point seven three hours a year. No wonder my Instagram feed is becoming a bit samey! I have moved on to 'Air', the second of the four elements, still exploring with Clem and her dust sheet. Today we stood on a gusty hilltop in a foot of mud, capturing wind by the light of the setting sun. 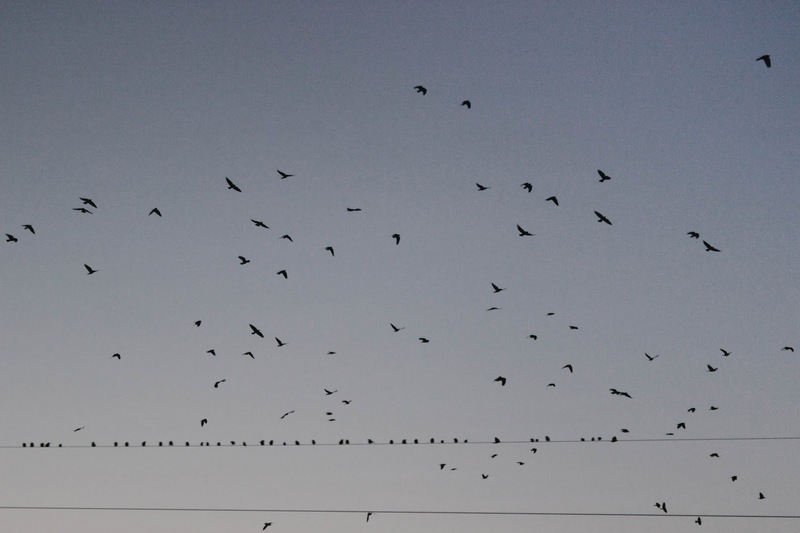 The rooks fly from the woodland to the hilltop every evening to sing by the setting sun. Once the light fades into a distant yellowy blue, back they go, dancing and interlocking, creating an ever-changing ceiling of bird. The skies become a blanket of swooping feathers, darting and gliding, cackling, framing the progression from day to night. Currently, I'm working under the title ''Earth, Air, Fire and Water'' in photography. On Sunday I managed to transform my sister into 'the Lady of the Woodland' (wrapping her up in a dust sheet, standing her in a bramble patch holding my rabbit...) and therefore ''Earth''. So I spent my Sunday wandering around London, my camera in one hand, a vegetable pasty in the other, stepping in and out of underground stations. This time I was 'gathering city-life environment shots for my contrast project' which was really just an unquestionable excuse to have brunch (cake+coffee) with my godmother.